The IBM® System Storage® SAN24B-4 Express fabric switch is designed to meet the needs of small- to medium-sized storage area network (SAN) environments. While a single SAN24B-4 switch offers the benefits of storage consolidation for new implementations of Fibre Channel storage systems, a high-availability solution can be created with redundant switches. It can be used to create a wide range of high-performance SAN solutions—helping to provide investment protection as SAN requirements evolve and grow over time. Easy-to-install and easy-to-use features designed specifically for small- to medium-sized environments. Reach new performance levels with 8-Gbps Fibre Channel technology. The SAN24B-4 switch offers the benefits of storage consolidation for new implementations of Fibre Channel storage systems. 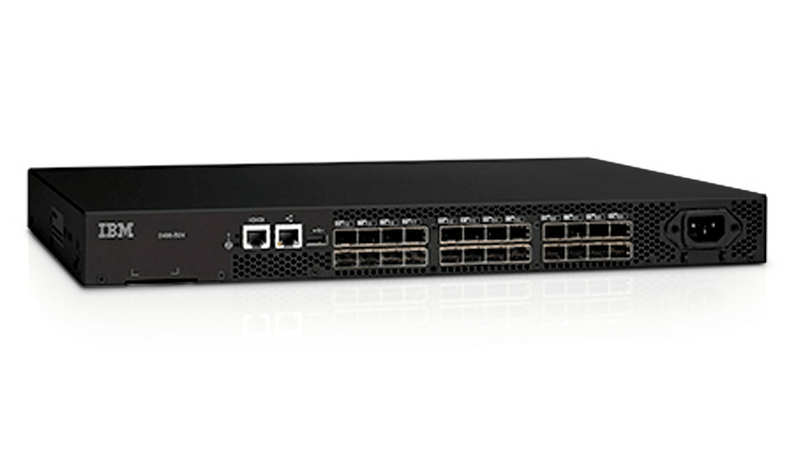 SAN24B-4 Express is configurable up to 24 ports and supports speeds up to 8 Gbps in an efficiently designed 1U form factor. With Ports on Demand, you can increase ports without taking switch offline.